Politicians and experts are highly concerned as the personal project of Facebook founder Mark Zuckerberg to link messages between the services is expected to be completed by the end of 2019 or early 2020. Facebook should not be allowed to implement a plan to integrate its platform with WhatsApp and Instagram because the social media giant has repeatedly violated pledges to protect user privacy in the past and cannot be trusted in the future, US Senator Jeff Merkley warned in a press release. "Now that Facebook plans to integrate its messaging services, we need more than mere assurances from the company that this move will not come at the expense of users’ data privacy and security," Merkley said on Friday. "We cannot allow platform integration to become privacy disintegration." 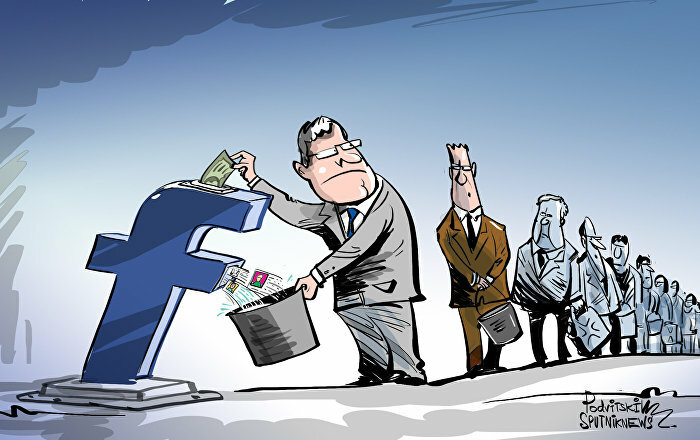 Merkley noted that the Federal Trade Commission (FTC) confirmed in March 2018 that Facebook’s privacy practices are being under an investigation and that the company may be in violation of a 2011 consent decree with the FTC. Marc Rotenberg, president and executive director the Electronic Privacy Information Center, also said on Friday that the integration would be “a terrible outcome for internet users” and urged FTC to “act now to protect privacy and to preserve competition” the New York Times reported. The concerns arise not only in the US but also in the UK, as the UK's Information Commissioner has already conducted investigations into how much data is shared between WhatsApp and Facebook. Zuckerberg, according to a report from the New York Times, wants to use the integration plan to make the trio of services more useful and increase the amount of time people spend on them. It would also be possible to create a single massive unified group of users to compete with Apple’s iMessage and Google’s messaging services. "We're working on making more of our messaging products end-to-end encrypted and considering ways to make it easier to reach friends and family across networks," the company added. According to the statement, there was a lot of “discussion and debate” on how the new system would eventually work. Instagram and Whatsapp were bought by Facebook a few years ago, yet continue to operate largely as independent companies. Zuckerberg’s plan reportedly had caused “internal strife”. It is considered to be part of the reason that the founders of both Instagram and WhatsApp left the company last year. Another possible benefit for merging the messaging services could be that it would provide an alternative way for Facebook to increase its revenues. WhatsApp currently generates little revenue; Instagram produces ad revenue but none from its messaging. A more engaged audience could result in new forms of advertising or other services for which Facebook could charge a fee, people familiar with the matter told the New York Times.